As the struggle to keep on top of company emails seems to grow every day, employees are trying whatever it takes to get their inbox back to normal. 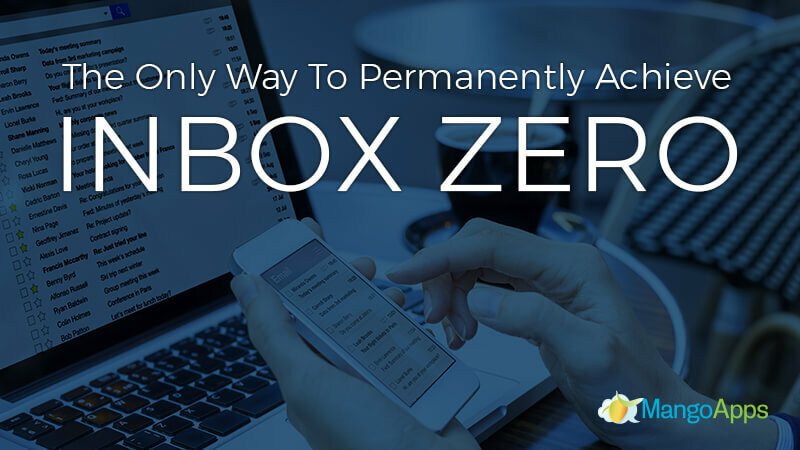 Inbox zero, as the idea has come to be known, is the attempt to reach an empty or close to an empty inbox, in an effort to be more productive and ultimately, spend more time actually getting work done. Hundreds of help guides, articles, and even training courses have recently been developed to assist employees in successfully sorting through their messages. These resources provide workers with ideas like dedicating a little time every day, adding automated responses, and using filters. And while these kinds of management solutions can help, the relief is, unfortunately, only temporary. Unless employees are incredibly vigilant, their inboxes will quickly be overflowing again, creating the same overwhelming situation they just seemed to escape. The problem is that current inbox zero tactics don’t take on the actual problem. Time management solutions and efficiency shortcuts are only methods of treating the symptoms of email overload. In reality, overwhelming email is a lot like an iceberg. While the issue might look small and simple at first, 90 percent of the problem actually lies beneath the surface. Only by changing our perspective and asking questions about communication, can we understand the whole picture and create real solutions. At MangoApps, we are proud to be communication experts who help businesses collaborate and work effectively every day. So we wanted to use our experience to take a look at company email beneath the surface and beyond the symptom level, and assess how permanent inbox zero can actually be achieved. The real problem with email is the way that it sends out information. Email is designed as a push system, meaning that information is presented or pushed at users, regardless of their want or interest in it. Push methods of communication are aggressive, intrusive and force users to engage with content. Anything with access to your email address has a way into your inbox. Push systems take away personal choice and require employees to make dozens of microdecisions every time they receive a notification or open their inbox. Microdecisions might not seem that significant, but research has shown that willpower and effective decision making are actually finite resources. This means that being perpetually bombarded with even small choices can lead to decision fatigue, resulting in increased mental exhaustion, reduced productivity, and worse decisions. Decision fatigue is particularly likely when the need to make decisions are forced upon us. When people feel that they are not in control of a situation, even at a subconscious level, they develop greater resentment and exhibit less patience. When we choose to actively participate or engage with content it becomes less of a burden as we take on more personal responsibility in the work and consequently more pride and care about the outcomes. Push communication by nature is noisy and cluttered as it seeks to distract and divert our attention from everything else around. This attack on our focus is overwhelming and can lead to overstimulation and increased stress and anxiety, especially when it seems that our best efforts are only keeping things at bay. And it only makes sense of email to eventually spiral out of control. The fact that thing will naturally move from a state of order to a state of disorder is an actual law of the universe. It’s true for the cosmos, your headphones, and certainly your inbox. Attempting to reach inbox zero by trying to keep a push method of communication under control is literally working against the universe. So how exactly are businesses supposed to communicate effectively? Switch to a pull method of communication. Unlike push communication, where participation is intrusive and demanding, pull communication acts as an invitation. This method gives users control over their content and works based on their specific interests and needs. Users are made aware of content and invited to engage but can choose for themselves when, where and even if they interact with it. Probably the most widely used form of pull communication is social media. In social media, users decided who to follow, who can follow them, and what specific followers are allowed to see. The content is always relevant to users and users have the ability to come and go and follow or unfollow as they see fit. As you might expect, the less demanding style of pull communication naturally solves most of the problems push communication generates. Pull communication instinctively reduces noise by giving you the freedom to control your environment, rather than desperately trying to manage communication constantly competing for your attention. Increased communication control lets users remove spam and reduce unwanted messages, keeping relevant content at the forefront, reducing anxiety and helping important information actually be dealt with. And while decision fatigue can still occur, by becoming an active participant in the process employees become more personally invested, more driven to complete tasks, and have an increased sense of satisfaction and accomplishment in their work. Henry Ford is attributed with saying “If I had asked people what they wanted, they would have said faster horses.” Often our natural response to a problem is to try and improve the current system when what we need is something new altogether. For successful business communication, the answer is not to manage email more efficiently to reach an eventual inbox zero but to change communication entirely from a push driven platform to a pull-driven solution, designed around present day business needs. Collaboration software tools, like those offered by MangoApps, offer businesses a platform for pull communication. These tools take the kinds of communication that typically happen over email and allow users to control what, where and how they participate with it, making it more effective, understandable, and engaging. Excessive emails, wasteful meeting and disorganization are three of the biggest hindrances to employee productivity. With collaboration software, users have the ability to follow and comment on any number of different company groups, projects, or teams. Having designated areas for specific content keeps information clear and organized and makes collaboration and teamwork easier. Employees can join and un-join groups as needed so that they are always in the loop on relevant information and never distracted by unnecessary content. Project, group and team areas also provide specific spaces for regular updates and status reports reducing the need for long or excessive meetings and making existing meetings more focused and productive. Because collaboration tools are internal, they remove the unnecessary spam and non-work related content estimated to take up about 18% of an employee inbox. Personalized newsfeeds and dashboards also provide the perfect location to share important company updates, announcements and reminders that would typically be found in a weekly update or newsletter email. Shared content can be pinned to a dashboard, generated into a to-do list or turned into a calendar event all within the same program, allowing employees to see and save for later only the specific content they need. Calendars built into the software show personal, team and company schedules, making planning and meeting much easier. Events and reminders can also be automatically created reducing the need to send out extra emails. Milestones, achievements, and recognition are built into collaboration systems as well, encouraging employers to publicly recognize significant life events, important achievements or anything else, without worrying about adding another email to an employee’s inbox. And because most employee email consists of internal coworkers communication, collaboration software, of course, allows employees to follow, post and comment on an individual profile, as well as communicate through private and instant message with either a group or an individual. When the idea of inbox zero was first introduced by Merlin Mann, his idea was actually about finding focus and peace of mind, rather than actually emptying an inbox. Mann said about the movement that zero didn’t refer to the number of messages but rather the amount of time your mind spent worried about your inbox. Mann was headed in the right direction, by trying to asses what was wrong with email communication and what about it needed to be changed. Unfortunately, as his idea spread, it was lost in an avalanche of easy answers and quick fix symptom treating ideas. But the workforce is ready for a real solution. 44 percent of today’s employees want a wider adoption of internal communication tools and 49 percent of millennials support using social tools for workplace collaboration. 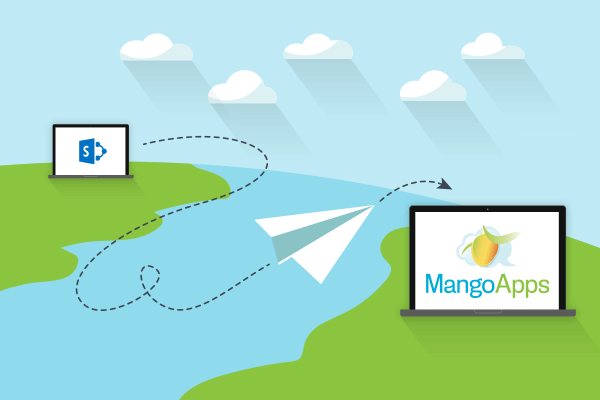 At MangoApps, we’re ready to help businesses both literally and mentally reach the real inbox zero with our newest platform, Mango Exchange. Mango Exchange is designed with inbox zero in mind and lets employees send targeted and personalized messages to anyone in the organization, from any device, without the distractions or frustrations of an inbox cluttered with SPAM or irrelevant messages. Because all of the interactions happen internally, organizations can rest assured, knowing that employees are communicating safely and securely, while avoiding phishing or other malicious threats that come with email. Productivity is also boosted with built-in calendaring, notes, and to-do lists. Mango Exchange aims to widely replace email inboxes for internal-facing employees while improving the way that businesses and employees interact. To see why employees don’t need email, learn more about Mango Exchange, and contact us to schedule a demo today.